Bakers' Stock — for all things baking! Merry Christmas everyone! My name is Lisa and I have a blog called The Bearfoot Baker. Anu was kind enough to let me hang out with you today so we could make some Christmas Cookies. As I looked through her selection of cookie cutters with a friend of mine, we came up with the idea of simple elf cookies made with an ice cream cutter. Want to make some simple elf cookies for yourself? Here is how. Have you made decorated sugar cookies before? If you haven’t don’t worry. Here is a Beginners Guide to Cookie Decorating full of videos, tutorials and tips. You will find cookie recipes, icing recipes with videos on how to make it. Begin by baking some ice cream cone cookies and a batch of royal icing. If you want to make a half batch of royal icing, click here for the recipe. Outline the face with the flesh colored icing. Outline the hat with the green icing. Flood every other section of hat with green and let it dry overnight. Humidity will cause the icing colors to run together. This is called bleeding. The longer you let the icing dry, the less chance for bleeding. Flood the face with the flesh colored icing and add 2 drops of white icing while the flesh color is wet. Drop in a 4 mm edible bead in each eye. Next, flood the red sections on the hat and let it dry for about an hour. Add a dot for the nose and a smile with the flesh colored icing. Make the dark green trim on the hat. Add a white dot of icing on the top of the hat. I hope you enjoyed these little guys as much as I do. Let me know if you have any cookie questions. You can email me at lisa@thebearfootbaker.com. With the 4th of July just a day a way, I was looking through my recipe box for a cake recipe I could make. I found a recipe I had cut out of a magazine a long time ago for a Holiday Poke Cake. I didn’t want to make it with the traditional white cake, so I looked a little further to find a recipe for a sponge cake. I thought I could use this recipe for cupcakes and use the Jell-O in the same way as in the cake. I wanted my cupcakes to follow the July 4th theme, so when I purchased the Jell-O I picked a red (cherry) and a blue (berry blue). When I poked the holes in the baked cupcakes, I tried both and even mixed them, I decided the red looked best with blue polka dot baking cups and brought the whole red, white and blue theme together. 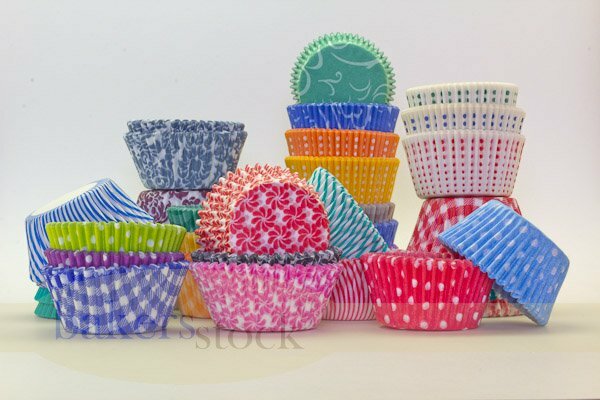 Line cupcake tins with baking cups. Preheat oven to 350 degrees F.
Place the butter, sugar, salt and vanilla extract in a bowl and cream together until pale. Beat the eggs lightly in another bowl and slowly add to the butter mixture while beating lightly. Once all the egg has been added and combined with the butter mixture, sift in the flour a little at a time and fold through until the batter is just combined. 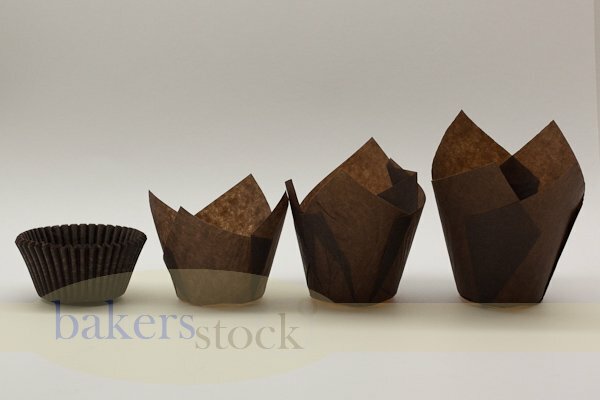 Divide the batter between 24 cupcake liners. Bake for 18-20 minutes. The cupcakes are done when a tester is inserted in the middle and comes out clean. Transfer baked cupcakes to a rack to cool. While the cupcakes are cooling, in another bowl stir 1 cup of boiling water into the gelatin mix. Stir Jell-O for two minutes or until completely dissolved. 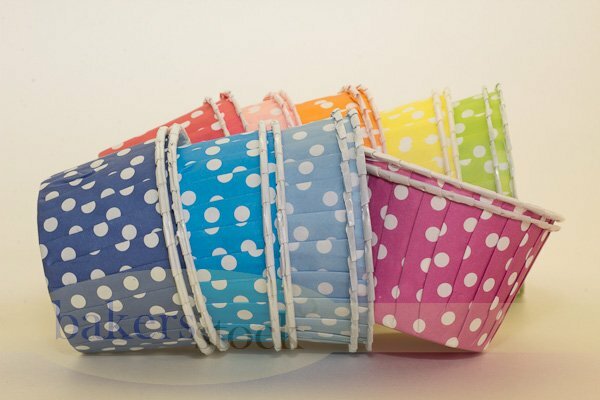 Using a large fork, poke a few holes in the top of each baked cupcake. Spoon 1 tablespoon of Jell-O over the top allowing the liquid to seep through holes. Mix all ingredients and beat until smooth. Frost each cupcake with cream cheese frosting. Store cupcakes in refrigerator.